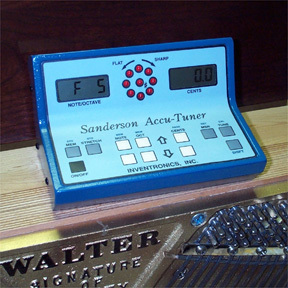 The original Sanderson Accu-Tuner features a sealed long-life keyboard, 40 piano memories, and twenty generic tunings (your choice from our extensive list). The SAT comes standard with Battery Charger, Foot Switch, and Operating Manual. It's small enough to fit in your tool box; 7.5" wide, 4" high, and 5" deep and weighs less than 1.5 pounds. It has all of the features of the SAT II except the MIDI ports. Other optional accessories: Additional Piano Memory Capacity; Aluminum Carrying Cases; Magnetic Pickup; Tuning Hammer Thumb Switch; and Instructional DVDs from Jim Coleman and George Defebaugh. FAC 88-Note Stretch Calculator sets note and cents for the entire piano automatically from just three measurements. (The results will amaze you). Pitch-Raise Calculator gives accurate pitch raises in twenty minutes or less. Store your own tunings, up to 206 complete individual piano tunings along with piano serial numbers for future use. Guaranteed accuracy within 0.04 cents for every note and cents deviation from -198.0 to + 160.0 cents. Memory that can be written and overwritten without limit. Choose from a library of generic piano tunings by make and model to be loaded into the SAT. FAC Stretch-Calculator tunings can be transferred to piano memory instantly with a pitch change for easy pitch raising, non-440 tuning, and early music pitch. Sealed Long-life Keyboard rated at over 1 million pushes per key. Foot pedal switch has ability to step up or down from note to note, or to store notes into memory, sequentially up or down. Rotating visual display with Light Emitting Diodes (LED's) instantly shows tuning error. Measure an unknown pitch by pressing the MSR button. Full set of input/output jacks for tuners, teachers, and experimenters. Comprehensive Operating Manual explains all operations including time-saving techniques for pitch raising and tuning. Toll-free number available for assistance with tuning problems in the field. With the SAT's 88-note FAC stretch calculator, you can measure the amount of stretch an aural tuner would put onto that piano, store three stretch numbers, and tune the entire piano without having to touch the SAT. Use the foot switch to advance the note while the SAT automatically sets the partial and cents deviation. This allows the tuner to keep his/her hands on the piano key and on the hammer, which speeds the work and reduces fatigue. The Accu-Tuner is priceless when tuning two or more pianos together - just tune them both to the same page in memory. The pianos don't even need to be in the same room! Students and new technicians can use the SAT as a visual aid for checking their work and accuracy. It can assist in teaching hammer technique and setting pins, as well as speeding up the learning rate of fine tuning. The PTG Tuning Exam Option, for only $150.00 more, can assist in both practicing for the PTG Tuning exam as well as scoring it. We Still repair early Accu-Tuners!